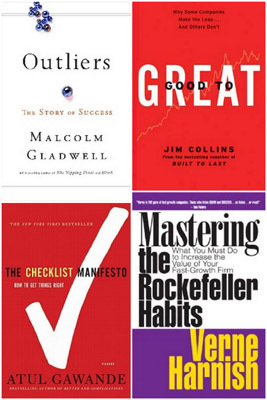 Reading biographies is inspiring, but sometimes we have to get into the nitty-gritty of business planning. We will discuss our favorite business books at tomorrow’s NEW Wine Women and Wellness event from 2-4 p.m. at 57th Street Books. RSVP on Facebook or our Meetup Group, or just pop in! “This is a hands-on, meat and potatoes kind of book that guides business owners and leaders through the concept of having and using a strategic plan,” she said. “Gladwell is one of my favorite authors, who’s style of writing really makes you go, aha! Why didn’t I see it this way?” Karen said. 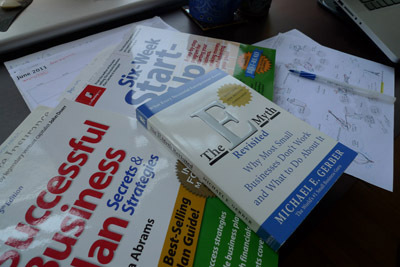 E-Myth is a great non-nonsense approach to setting up a business. It basically walks the reader through the operations of a business and insists that even as a solopreneur, you sort your roles out by category so that as you grow you have job descriptions at the ready to help you outsource tasks. It is not as complex as an actual business plan, but does showcase the need for a distinction of roles so you can avoid the pitfalls other businesses have faced from relying on reactive management and implicit partnerships. 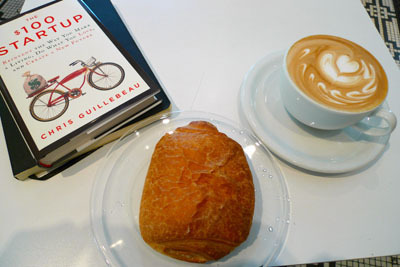 I’m very inspired by Chris Guillebeau, author of The Art of Nonconformity and The $100 Startup. The Art of Nonconformity addresses how we get caught up a sort of Groupthink of what our lives are supposed to be like, but that living our true wishes and aspirations can be far more rewarding. I still feel ‘conformist’ in many ways, but this book has helped me realize that I may not be so weird with my dreams after all. The $100 Startup offers case studies and worksheets to debunk the myth that we need angel investors or huge savings to make our dreams come true. Chris interviews a variety of businesses making a minimum of $50,000 in annual income, showing that 1. We don’t have to wait for a big payday to realize our dreams and 2. Success doesn’t necessarily consist of 6-figure or million-dollar goals. I also have the Business Plan workbooks pictured above, but have not made it through either of them, because my business has been in such flux over the past year in terms of artistic focus and even the products that are actually selling. My goal is to get back to these though and set up a more formal business plan as I flesh out what makes sense for me from a financial and creative perspective. What I do is check all these types of books out from the library, and if they resonate with me I buy them to actually use them. Ultimately you have to determine what inspires you, what appeals to you, and whether you learn through audio, visuals, reading or other means. It never hurts to fill your brain with insights and the experience of others, and then to pull out of that knowledge what applies to you. On that note, I also want to mention The 4-Hour Workweek by Timothy Ferriss. It is similar to Nonconformity in that it values efficiency over working the traditional 9 to 5 job. I like this book for its thought-provocation and its resources, but it is skewed toward more service-oriented vocations or electronic products, making heavy use of Virtual Asistants, automated systems, and the internet. Not as applicable to those with handmade products, retail stores, or location-oriented businesses. I also think that most entrepreneurs like being involved in the day-to-day operations, and this seems to be more geared toward people who like to live a mobile lifestyle away from the business. I can’t find the article now, but there was a journalist seeking Tim out to see how he is doing, a few years later, but not being able to track him down, causing a bit of skepticism on the truth of his claims. I’ve read numerous books on starting a creative business too, but that list will take some time to compile. Join us tomorrow to share your favorite reads!